KINGSTOWN, ST VINCENT – “St Vincent must not be left behind in the digital age,” says Dr Jerrol Thompson, Minister of Telecommunications, Science, Technology and Industry of St Vincent and the Grenadines. He added that a local IXP would allow for the free exchange of domestic Internet traffic between internet service providers. This is essential for the development of a robust, Internet –based domestic economy and for the delivery of new, citizen-centric Government services, Thompson said. Minister Thompson was speaking at the opening of the Caribbean Telecommunications Union (CTU) Symposium on the establishment of an Internet Exchange Point in St Vincent and the Grenadines. The CTU symposium, held in collaboration with US-based nonprofit Packet Clearing House (PCH), was convened by the Government of St Vincent and the Grenadines at the Knowledge Institute and Conference Centre in Kingston, St Vincent. She added, “Caribbean Governments adopting Internet-based applications for internal processes and to deliver services to their citizens, need to consider the value of an IXP in keeping domestic traffic local and reducing the risk of scrutiny of data packets by external agents." Feature speakers Bevil Wooding of Packet Clearing House and Stephen Lee, a consultant with the CTU, examined how IXPs help stimulate market entry by new ISPs, web hosting and equipment co-location developers and content creators. Participants were also given an overview of international best practice using case studies from around the world. The CTU, together with Packet Clearing House, is seeking to address this situation by raising awareness, promoting the benefits of national exchanges and facilitating the development process as part of its ongoing Caribbean ICT Roadshow. Minister Thompson indicated that “establishing an IXP is a top priority for the Government and we are committed to facilitating the process to making this a reality." Participants representing the Government of St Vincent and the Grenadines , Internet Service Providers, regulatory authorities, civil society and private sector businesses came together for the half-day meeting, designed to raise awareness of the technical considerations and economic and social benefits of establishing an Internet Exchange Point in St Vincent and the Grenadines. The CTU is a policy formulation body, acting in an advisory capacity to the governments of the region. The organisation was established 20 years ago by regional heads of government to advise the regional governments on matters related to ICT. 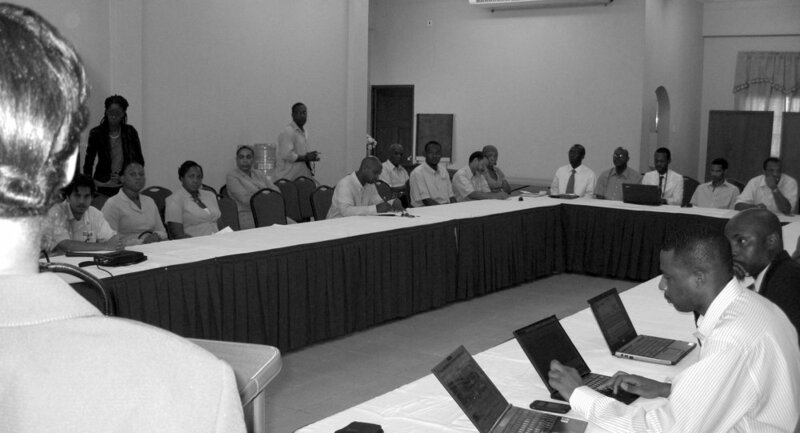 The CTU has been involved in the harmonization of policies across the Caribbean for the development of the ICT sector. It is governed by a Conference of Ministers from telecommunication and information ministries of the regional governments. Its membership base comprises governments, private sector and civil society organisations. The Caribbean ICT Roadshow will visit 20 countries over a 10 month period and culminate with a regional ICT symposium in the second quarter of 2010. Packet Clearing House is a not-for-profit research institute with offices in San Francisco, London, and Kathmandu. PCH provides services to the public without cost or restriction wherever possible. PCH staff is drawn from the ranks of senior engineers and executives of Internet and telecommunications networking companies in many countries. Their decades of real-world experience in diverse regions of the world inform the organization's work, perspective, and ability to bridge disparate communities of interest. PCH conductions workshops and develops and supports a variety of tools and services for the ISP, policymaking, and research communities.